Hi there, my darlings! I have another quick post to share with you all tonight! This is my first experience with a brand whose owner has been following ColorSutraa almost since the very beginning! So when I heard that she had brought out her own line of polishes, I was incredibly excited...and let me tell you, if this beauty is anything to go by, Mill and Anonymous Lacquer is a brand to watch out for! Fangalicious 2.0 is a stunning vampy burgundy holo with added microglitter. Fantastic formula and application, the swatches below show 2 easy coats topped with 1 generous coat of Glisten & Glow's HK Girl topcoat. So sparkly, oh-so-gorgeous! So there you have it, my darlings! If you would like to add this beauty to your collection or take a peek at some of the other fabulous holos she has in store, you can find them at Mill's store HERE--prices vary from $6.00 for a mini, 5 mL bottle to $11.00 for a full-size, 15 mL bottle. 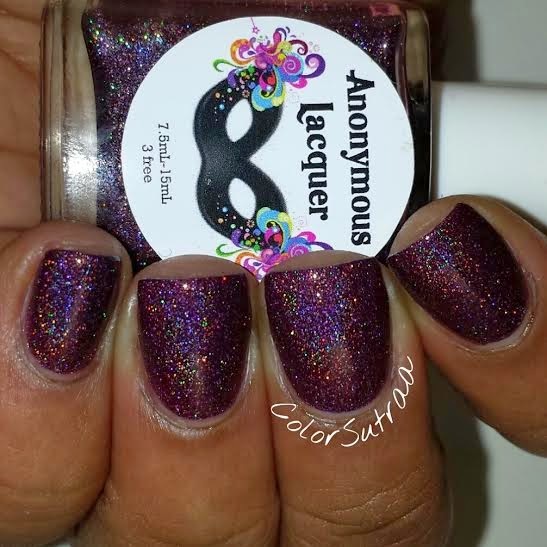 Don't forget to follow Anonymous Lacquer on FACEBOOK and INSTAGRAM for sneak peeks of her latest products! 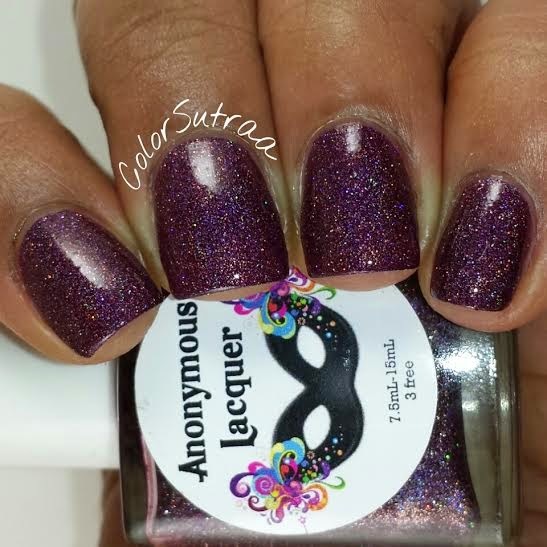 Do you have any Anonymous Lacquers in your stash? Which ones are YOUR favorites? I'd love to hear from you in the comments section below!